St. 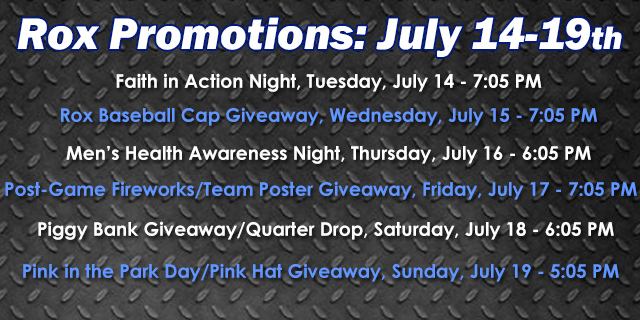 Cloud, Minn. – This week the Rox return home for a six game home stand packed full of fun promotions at the Rock Pile. The home stand will begin on Tuesday, July 14 at 7:05 p.m. versus the Willmar Stingers. Gates will open at 6:05 p.m. to fans. It will be Faith in Action Night with a pre-game youth clinic presented by Fellowship of Christian Athletes, YMCA, and Northland Capital Financial Services, LLC. The Rox will finish up the two-game series against the Stingers on Wednesday, July 15 at 7:05 p.m. When the gates open at 6:05 p.m. there will be a Rox Baseball Cap Giveaway presented by PreferredOne. First 350 fans. On Thursday, July 16 the Rox will start off the night by resuming a game versus the Green Bay Bullfrogs starting at 6:05 p.m. Gates will open at 6:30 p.m. while the game will begin in the bottom of the 13th inning. Game two of the day is scheduled to begin at 7:05 p.m. It will be Men's Health Awareness Night presented by CentraCare Clinic-Adult & Pediatric Urology. One lucky guy will win a grill. Friday, July 17 will wrap up the series versus the Bullfrogs starting at 7:05 p.m. Gates will open at 6:05 p.m. and it will be Friday Night Fireworks presented by Xcel Energy. Team Poster Giveaway presented by Rengel Printing, Bella Rose Photography and Times Media. FIrst 1,000 fans. The Rox will start a two-game series versus the Thunder Bay Border Cats on Saturday, July 18 starting at 6:05 p.m. while gates will be opened at 5:05 p.m. Saturday night will be a Piggy Bank Giveaway and Quarter Drop presented by Great River Federal Credit Union. First 300 kids 12 and under will receive a piggy bank and have a chance to pick up 4,000 quarters on the field after the game. The home stand will wrap up on Sunday, July 19 as the Rox finish off the series against the Border Cats starting at 5:05 p.m. Gates will open at 4:05 p.m. It will be Pink in the Park Day presented by Center for Diagnostic Imaging. Rox will be wearing pink jerseys that will be auctioned off with proceeds going to American Cancer Society Making Strides Against Breast Cancer. First 350 fans receive a Pink Cap courtesy of Medica. It will also be a Coborn's Kids' Day. Kids can run the bases and get autographs on the field after the game.